Keep the party going with Furby Party Rockers! Electronic plush toys speak English and Furbish. Give them virtual party snacks with the free Furby app! Keep the party going with Furby Party Rockers Electronic Plush Toys! Each fuzzy little pal speaks English and Furbish, is compatible with iOS 4.2 or later, and has adorable light-up eyes. Shake, pull, and party with these little guys, and give them some virtual party snacks using your iPhone or iPad with the free Furby app! Requires 3x "AAA" batteries, not included. Ages 6 and up. 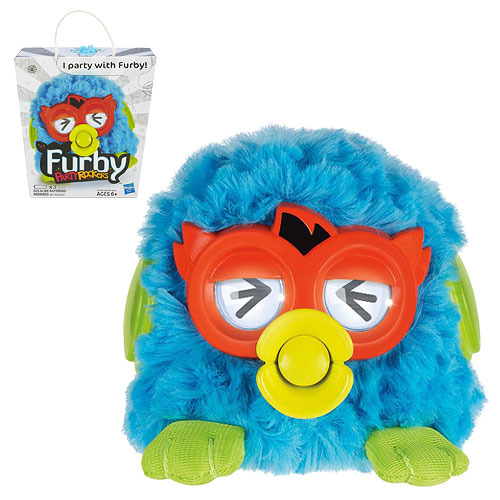 The blue Furby Party Rockers Electronic Plush Twittby has red eyes and is sure to delight!